July was slightly below the average as to the temperature and above the average as to the precipitation.Due to the windstorm on 23rd of July 37 hectares of hop gardens in Saaz area totally fell. However necessary trellis repair and wire re-hanging with fallen hop plants have been also done in other hop gardens. Till the end of July approx. 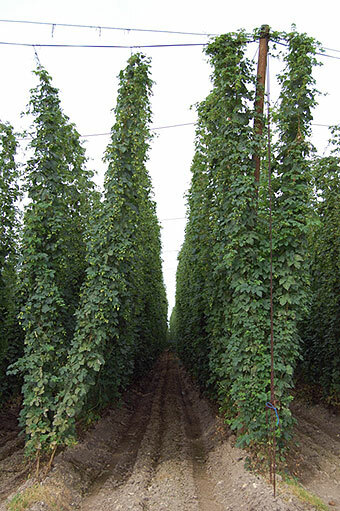 95 % of hop plants reached 7 meters height. Most of hop plants were at the end of July in the stage of cones creating and partially in the flowering phase. Chemical protection against Peronospora was continuing. Appearance of Hop Aphids and Red Spider Mite was sporadic only. Health state of hop plants is very good. The harvest should start between August 17 and 20. It´s still too early for whatever yield estimation. However based on present stand we expect better result than last year. Attached pictures show typical stand on July 31, 2009.